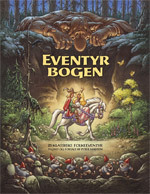 Eventyrbogen (The Fairy Tale Book) is Peter's old wish come true: Collecting and retelling all the best folk tales in one book - and illustrating them! In this collection you will find well known stories like "Snow White", "Hansel and Gretel" and "Puss in Boots" along with lesser known ones like "The Princess on the Glass Hill", "The Fisherman and his Wife" and "Soria Moria Castle". Peter has told all the fairy tales in their entirety based on Perrault's, The brothers Grimm's, Asbjørnsen and Moe's and Svend Grundtvig's retellings of the beloved tales. The 200-page book is fully illustrated with 175 big colour illustrations. "My goal has been to create a fairy tale book for the child I once was, and for the adult I am today. I have not worried about target groups or commercial opportunities at all. The only way to make a good book is to make it for yourself - that is my creative drive", Peter says. The Fairy Tale Book took two years of intensive labour to complete.